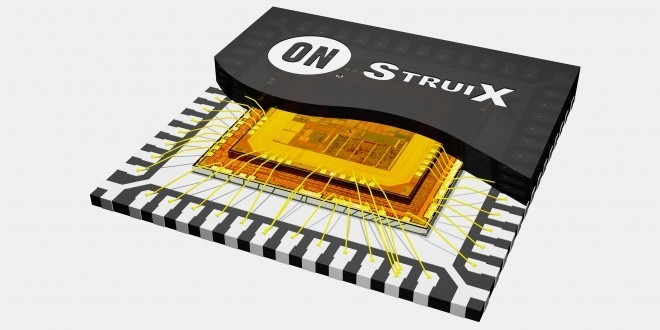 ON Semiconductor has introduced Struix, a semi-customisable System-in-Package (SiP) solution for precision sensing and monitoring in mobile medical electronics, such as glucose monitors, heart rate monitors and electrocardiogram analysers. The ULPMC10 microcontroller element of Struix processes signals using an industry-leading 32-bit ARM® Cortex®-M3 core capable of running up to frequencies of 30 megahertz (MHz). The microcontroller incorporates 512 kilobytes (kB) on-chip Flash memory and 24 kB SRAM memory to store critical program and user data. Designed to improve battery life in portable devices, ULPMC10 offers superior performance with minimal dynamic and static power demands. Through on-chip charge pump-based power conversion and regulation, the microcontroller can operate at a current consumption of less than 200 µA/MHz. While in standby mode, current consumption remains below 500 nanoamperes (nA), a critical parameter for low-duty cycle medical devices. The power management subsystem monitors the device for fail-safe operation with a wide variety of battery voltages without requiring external components. The microcontroller also includes a12-bit analog-to-digital converter with three multiplexed inputs, a real-time clock, a phase-locked-loop, and a temperature sensor. To simplify product development, ON Semiconductor offers a comprehensive and easy-to-use suite of development add-ins for IAR Systems to support the ULPMC10 microcontroller, including CMSIS based software interfaces.